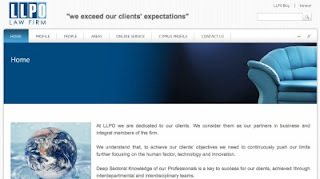 LLPO LAW FIRM, Cyprus law firm with offices in Nicosia, Athens and Bucharest, announces the launch of their new web site. The Cypriot law firm’s new web site (www.llpolawfirm.com) features dedicated sections for each of their practice areas, sectors, case results, and blogs with our lawyers’ comments, upcoming events, publications or news. Furthermore, the new web page features a clean design and easy navigation for its visitors. LLPO Law Firm has introduced new elements that will show the firm’s daily activities to their current and prospective customers, becoming very dynamic web –site. In addition, LLPO Law Firm is conscious about the impact that social networking has made in how lawyers and clients interact, so through www.llpolawfirm.com the visitors will access to LinkedIn or Skype. Andreas N. Leonidou, partner of LLPO Law Firm, said “that’s the perfect way to be more approachable to our clients. Through our new web page our clients will be informed about our Firm’s activities”. The new website even includes information about the partners, managers and lawyers of each office. It provides information about their experience and their interests.